Hurricane activity IS connected to the solar cycle. ………. years with positive SSN anomalies featuring high peripheral month sunspot numbers but low in-season numbers have, on average, significantly more (79%) US hurricanes. The SSN anomaly was shown to be statistically significant in models for US hurricanes and US major hurricanes after accounting for the other climate variables. We are coming to the end of Solar Cycle 24 (“low in-season numbers”) but are seeing some major solar storm activity. It would seem that the conditions for hight hurricane activity are again fulfilled. 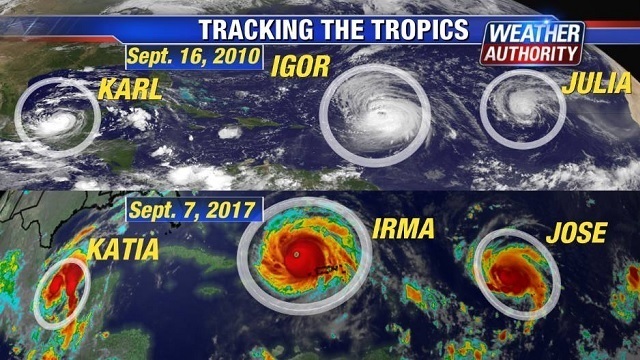 In 2010, the hurricane image was remarkably like the one being currently seen. Even before the 2010 hurricane season, this article in the International Journal of Climatology found a clear connection with the Sea Surface temperature (SST) and the solar cycle. The relationship between US hurricanes and solar activity is investigated empirically. First, a relationship between the probability of a US hurricane and the solar cycle is shown conditional on sea surface temperatures (SST). For years of above normal SST, the probability of three or more US hurricanes decreases from 40 to 20% as sunspot numbers (SSN) increase from lower to upper quartile amounts. Second, since SST is in phase with the 11-year total solar irradiance cycle but upper-air temperature is in phase with ultraviolet radiation changes on the monthly time scale, an anomaly index of SSN is constructed. The index is significantly correlated with US hurricanes and major US hurricanes over the period 1866-2008. The chances of at least one hurricane affecting the United States in the lowest and highest SSN anomaly seasons are 68 and 91%, respectively. A similar relationship is noted using hurricane records spanning the period 1749-1850, providing independent corroborating evidence linking solar variability to the probability of a US hurricane. The Sun is the ultimate driver of climate. The evidence for a sun–hurricane relationship was further bolstered by showing that a similar relationship between the SSN anomaly and US hurricanes (years of high SSN anomaly have more US hurricanes) is detectable in an archive of Atlantic hurricanes dating back to 1749. ………. 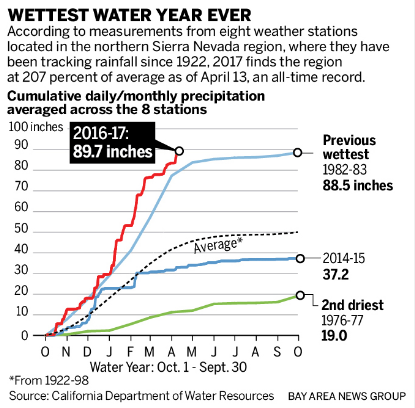 So much for the global-warming induced, permanent drought that had afflicted California. Population in California has doubled since 1979 but water resources infrastructure has not changed much. Ground water is being consumed and depleted at an increasing pace. Yet normal weather variations are taken to be man-made global warming. California remains normal, but Californians ……. An index of precipitation at eight sensors showed that just under 90 inches of rain and snow have fallen this winter in the northern Sierra Nevada. The previous record of 88.5 inches was set in the winter of 1982-1983. The average for the region is 50 inches a year, according to the state Department of Water Resources. The record was surpassed less than a week after Gov. Jerry Brown officially declared an end to California’s drought emergency — a largely symbolic pronouncement that left in place some water-conservation rules for the 40 million residents of the nation’s most populous state. More snow and rain is likely to pad the record before the wet season ends. This new paper finds that CO2 concentration in the atmosphere has risen by 110 ppm since 1750, but of this the human contribution is just 17 ppm. With the concentration now at 400 ppm, the human contribution is just 4.3%. The results indicate that almost all of the observed change of CO2 during the Industrial Era comes, not from anthropogenic emissions, but from changes of natural emission. The general assumption by IPCC and the global warming fraternity that natural carbon dioxide absorption and emissions are miraculously in balance and, therefore that man-made emissions are solely responsible for the increase in carbon dioxide concentration is deeply flawed (if not plain stupid). Clearly this paper is not at all to the liking of the religious zealots of the “global warming brigade” and is causing much heartburn among the faithful. •An alternative carbon cycle is presented in agreement with the carbon 14 decay. •The CO2 uptake rate scales proportional to the CO2 concentration. •Temperature dependent natural emission and absorption rates are considered. •The average residence time of CO2 in the atmosphere is found to be 4 years. •Paleoclimatic CO2 variations and the actual CO2 growth rate are well-reproduced. •The anthropogenic fraction of CO2 in the atmosphere is only 4.3%. •Human emissions only contribute 15% to the CO2 increase over the Industrial Era. Abstract: Climate scientists presume that the carbon cycle has come out of balance due to the increasing anthropogenic emissions from fossil fuel combustion and land use change. This is made responsible for the rapidly increasing atmospheric CO2 concentrations over recent years, and it is estimated that the removal of the additional emissions from the atmosphere will take a few hundred thousand years. Since this goes along with an increasing greenhouse effect and a further global warming, a better understanding of the carbon cycle is of great importance for all future climate change predictions. We have critically scrutinized this cycle and present an alternative concept, for which the uptake of CO2 by natural sinks scales proportional with the CO2 concentration. In addition, we consider temperature dependent natural emission and absorption rates, by which the paleoclimatic CO2 variations and the actual CO2 growth rate can well be explained. The anthropogenic contribution to the actual CO2 concentration is found to be 4.3%, its fraction to the CO2 increase over the Industrial Era is 15% and the average residence time 4 years. Climate scientists assume that a disturbed carbon cycle, which has come out of balance by the increasing anthropogenic emissions from fossil fuel combustion and land use change, is responsible for the rapidly increasing atmospheric CO2 concentrations over recent years. While over the whole Holocene up to the entrance of the Industrial Era (1750) natural emissions by heterotrophic processes and fire were supposed to be in equilibrium with the uptake by photosynthesis and the net oceanatmosphere gas exchange, with the onset of the Industrial Era the IPCC estimates that about 15 – 40 % of the additional emissions cannot further be absorbed by the natural sinks and are accumulating in the atmosphere. The IPCC further argues that CO2 emitted until 2100 will remain in the atmosphere longer than 1000 years, and in the same context it is even mentioned that the removal of human-emitted CO2 from the atmosphere by natural processes will take a few hundred thousand years (high confidence) (see AR5-Chap.6-Executive-Summary). Since the rising CO2 concentrations go along with an increasing greenhouse effect and, thus, a further global warming, a better understanding of the carbon cycle is a necessary prerequisite for all future climate change predictions. In their accounting schemes and models of the carbon cycle the IPCC uses many new and detailed data which are primarily focussing on fossil fuel emission, cement fabrication or net land use change (see AR5-WG1-Chap.6.3.2), but it largely neglects any changes of the natural emissions, which contribute to more than 95 % to the total emissions and by far cannot be assumed to be constant over longer periods (see, e.g. : variations over the last 800,000 years (Jouzel et al., 2007); the last glacial termination (Monnin et al., 2001); or the younger Holocene (Monnin et al., 2004; Wagner et al., 2004)). Different to the IPCC we start with a rate equation for the emission and absorption processes, where the uptake is not assumed to be saturated but scales proportional with the actual CO2 concentration in the atmosphere (see also Essenhigh, 2009; Salby, 2016). This is justified by the observation of an exponential decay of 14C. A fractional saturation, as assumed by the IPCC, can directly be expressed by a larger residence time of CO2 in the atmosphere and makes a distinction between a turnover time and adjustment time needless. Based on this approach and as solution of the rate equation we derive a concentration at steady state, which is only determined by the product of the total emission rate and the residence time. Under present conditions the natural emissions contribute 373 ppm and anthropogenic emissions 17 ppm to the total concentration of 390 ppm (2012). For the average residence time we only find 4 years. The stronger increase of the concentration over the Industrial Era up to present times can be explained by introducing a temperature dependent natural emission rate as well as a temperature affected residence time. With this approach not only the exponential increase with the onset of the Industrial Era but also the concentrations at glacial and cooler interglacial times can well be reproduced in full agreement with all observations. So, different to the IPCC’s interpretation the steep increase of the concentration since 1850 finds its natural explanation in the self accelerating processes on the one hand by stronger degassing of the oceans as well as a faster plant growth and decomposition, on the other hand by an increasing residence time at reduced solubility of CO2 in oceans. The results are consistent with the observed lag of CO2 changes behind temperature changes (Humlum et al., 2013; Salby, 2013), a signature of cause and effect. Our analysis of the carbon cycle, which exclusively uses data for the CO2 concentrations and fluxes as published in AR5, shows that also a completely different interpretation of these data is possible, this in complete conformity with all observations and natural causalities. I expect there will be a concerted effort by the faithful to try and debunk this (and it has already started). Even though the combustion of fossil fuels only contributes less than 4% of total carbon dioxide production (about 26Gt/year of 800+GT/year), it is usually assumed that the sinks available balance the natural sources and that the carbon dioxide concentration – without the effects of man – would be largely in equilibrium. (Why carbon dioxide concentration should not vary naturally escapes me!). It seems rather illogical to me to claim that sinks can somehow distinguish the source of carbon dioxide in the atmosphere and preferentially choose to absorb natural emissions and reject anthropogenic emissions! Also, there is no sink where the absorption rate would not increase with concentration. Carbon dioxide is accumulating in the atmosphere by about 15 GT CO2/ year. The accuracy of the amounts of carbon dioxide emitted by transpiration and by the oceans is no better than about 2 – 3% and that error band (+/- 20GT/year) is itself almost as large as the total amount of emissions from fossil fuels. This paper in Nature would not have have had any chance of being published a few years ago. But times are changing. CNRS: “The possibility of major climate change in the Atlantic region has long been recognized and has even been the subject of a Hollywood movie: The Day After Tomorrow. To evaluate the risk of such climate change, researchers from the Environnements et Paléoenvironnements Océaniques et Continentaux laboratory (CNRS/University of Bordeaux) and the University of Southampton developed a new algorithm to analyze the 40 climate models considered by the latest report from the Intergovernmental Panel on Climate Change (IPCC). Their findings raise the probability of rapid North Atlantic cooling during this century to nearly 50%. Nature Communications publishes their work on February 15, 2017”. My own view is that man-made global warming is insignificant and virtually impossible to measure. The apparent climate turbulence we may currently be experiencing is probably the exhibition of instabilities as climate shifts from an interglacial paradigm to the, more normal, glacial conditions. The transition will probably be “rapid” in geologic terms which probably means a thousand years or so. Major volcanic eruptions (VEI>6) are overdue. This interglacial has lasted some 13,000 years and is also, relatively, long. I think it feasible that 2 or 3 major volcanic eruptions in relatively quick succession could provide the conditions to trigger a full transition. Once glacial conditions are established they will last for about 100,000 years. And we will then be very thankful for all the fossil or nuclear energy we can have available to us. Abstract: Observations over the 20th century evidence no long-term warming in the subpolar North Atlantic (SPG). This region even experienced a rapid cooling around 1970, raising a debate over its potential reoccurrence. Here we assess the risk of future abrupt SPG cooling in 40 climate models from the fifth Coupled Model Intercomparison Project (CMIP5). Contrary to the long-term SPG warming trend evidenced by most of the models, 17.5% of the models (7/40) project a rapid SPG cooling, consistent with a collapse of the local deep-ocean convection. Uncertainty in projections is associated with the models’ varying capability in simulating the present-day SPG stratification, whose realistic reproduction appears a necessary condition for the onset of a convection collapse. This event occurs in 45.5% of the 11 models best able to simulate the observed SPG stratification. Thus, due to systematic model biases, the CMIP5 ensemble as a whole underestimates the chance of future abrupt SPG cooling, entailing crucial implications for observation and adaptation policy. 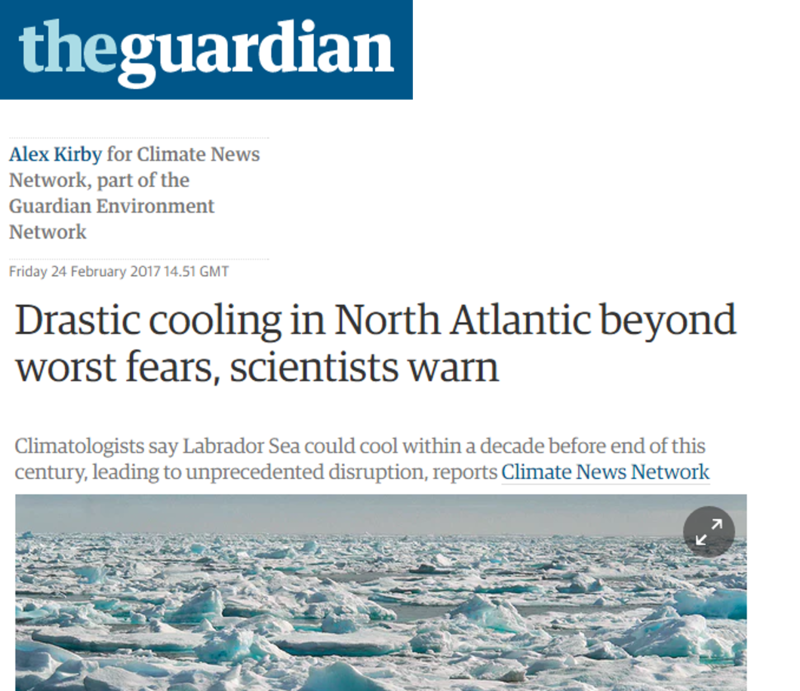 Even The Guardian (a high priest of the man-made global warming religious fantasy) is compelled to report!! Current climate models all foresee a slowing of the meridional overturning circulation (MOC)2—the phenomenon behind the familiar Gulf Stream, which carries warmth from Florida to European shores—that could lead to a dramatic, unprecedented disruption of the climate system. In 2013, drawing on 40 climate change projections, the IPCC judged that this slowdown would occur gradually over a long period of time. The panel’s findings suggested that fast cooling of the North Atlantic during this century was unlikely. Oceanographers from the EU EMBRACE project team reexamined the 40 projections by focusing on a critical spot in the northwest North Atlantic: the Labrador Sea. The Labrador Sea is host to a convection system ultimately feeding into the ocean-wide MOC. The temperatures of its surface waters plummet in the winter, increasing their density and causing them to sink. This displaces deep waters, which bring their heat with them as they rise to the surface, preventing the formation of ice caps. To investigate this phenomenon in greater detail, the researchers developed an algorithm able to detect quick sea surface temperature variations. Their number crunching revealed that 7 of the 40 climate models they were studying predicted total shutdown of convection, leading to abrupt cooling of the Labrador Sea: by 2–3 °C over less than 10 years. This in turn would drastically lower North Atlantic coastal temperatures. But is such rapid cooling a real possibility? (After all, only a handful of the models supported this projection.) To answer this question, the researchers honed in on the critical parameter triggering winter convection: ocean stratification. Indeed, 11 of the 40 models incorporated vertical variation in the density of oceanic water masses. And of these 11 models, which we may furthermore consider to be the most reliable, 5 (i.e., 45% of the models) predicted a rapid drop in North Atlantic temperatures. That the onset of glacial (cold) and interglacial (warm) periods on earth are a consequence of the Milankovitch cycles is almost certain. Researchers have now developed a model which seems to be able to explain why and when glacial periods end to give interglacial conditions. Exactly what cause glacial conditions to be triggered remains to be discovered. Abstract: The pacing of glacial–interglacial cycles during the Quaternary period (the past 2.6 million years) is attributed to astronomically driven changes in high-latitude insolation. However, it has not been clear how astronomical forcing translates into the observed sequence of interglacials. Here we show that before one million years ago interglacials occurred when the energy related to summer insolation exceeded a simple threshold, about every 41,000 years. Over the past one million years, fewer of these insolation peaks resulted in deglaciation (that is, more insolation peaks were ‘skipped’), implying that the energy threshold for deglaciation had risen, which led to longer glacials. However, as a glacial lengthens, the energy needed for deglaciation decreases. A statistical model that combines these observations correctly predicts every complete deglaciation of the past million years and shows that the sequence of interglacials that has occurred is one of a small set of possibilities. The model accounts for the dominance of obliquity-paced glacial–interglacial cycles early in the Quaternary and for the change in their frequency about one million years ago. We propose that the appearance of larger ice sheets over the past million years was a consequence of an increase in the deglaciation threshold and in the number of skipped insolation peaks. …. In a new study published today in Nature, researchers from UCL (University College London), University of Cambridge and University of Louvain have combined existing ideas to solve the problem of which solar energy peaks in the last 2.6 million years led to the melting of the ice sheets and the start of a warm period. The results explain why we have been in a warm period for the last 11,000 years: despite the weak increase in solar energy, ice sheets retreated completely during our current interglacial because of the very long waiting time since the previous interglacial and the accumulated instability of ice sheets. …..
What would cause the current interglacial to end remains to be discovered. It’s only my speculation of course but I suspect that a trigger event is probably needed. Possibly 2 or 3 major (VEI >6) volcanic eruptions over a short period, with large amounts of dust, which in turn led to a a few “years without summers”, could provide such a trigger for an unstoppable process. However the onset of full glacial conditions would still take a few thousand years. The availability of high energy densities would probably make it (relatively) easy for humans to continue to thrive and prosper (as they have done through other glacial periods with much lower energy availability). The “global temperature” is calculated by dividing the world into a grid, determining the temperature applying to each grid element and then “calculating” (not a simple average) a “global temperature” to apply to the world. The problem is that there are actual measurements (raw data) for just about 20% of the grid elements. These 20% are then used to “fill in” temperatures for all the other grid elements. There are algorithms devised first for “correcting” the raw data, then there are those governing the manner in which the corrected data are to be combined to fill in empty grid elements, and further algorithms to be used when combining all the elements of the grid to give a single “global temperature”. The accuracy of the raw data is only about 0.1ºC while the “global temperature” is presented to 0.001ºC, and differences of the order of 0.001ºC are used to make conclusions for “policy” decisions. Climategate 1 revealed how data has been cherry picked and fudged for the first time. The deception continues. …….. NOAA Administrator’s Award 2004 for “outstanding administration and leadership in developing a new division to meet the challenges to NOAA in the area of climate applications related to remotely sensed data”. He was awarded a U.S. Department of Commerce Gold Medal in 2014 for visionary work in the acquisition, production, and preservation of climate data records (CDRs). He has held elected positions at the American Geophysical Union (AGU), including Member of the AGU Council and Member of the AGU Board. He has played a leadership role in data management for the AGU. He has a guest post at Judith Curry’s blog. Of course the mainstream, politically correct media have no time for this. However David Rose of the Mail on Sunday is one of the few reporters who still has the nerve to question the fanatic, religious orthodoxy on this subject. His vehement objections to the publication of the faulty data were overridden by his NOAA superiors in what he describes as a ‘blatant attempt to intensify the impact’ of what became known as the Pausebuster paper. ……. There will be more whistle-blowers now stepping out from behind the woodwork. The three Milankovitch orbital cycles, due to eccentricity (100,000 years), axial tilt (41,000 years), and precession (23,000 years) have long been thought to be connected to the onsets of glacial or interglacial conditions. New research now suggests that growth of sea ice in the Southern Hemisphere at particular times of the Milankovitch cycles could be the trigger for a new glacial age. The work suggests that different orbital cycles have been predominant at different times. The proxy record of global temperature shows that the dominant periodicity of the glacial cycle shifts from 40-kyr (obliquity) to 100-kyr (eccentricity), about a million years ago. Using climate model simulations, here we show that the pace of the glacial cycle depends on the pattern of hemispheric sea ice growth. In a cold climate the sea ice grows asymmetrically between two hemispheres under changes to Earth’s orbital precession, because sea ice growth potential outside of the Arctic Circle is limited. This difference in hemispheric sea ice growth leads to an asymmetry in absorbed solar energy for the two hemispheres, particularly when eccentricity is high, even if the annual average insolation is similar. In a warmer climate, the hemispheric asymmetry of the sea ice decreases as mean Arctic and Antarctic sea ice decreases, diminishing the precession and eccentricity signals and explaining the dominant obliquity signal (40-kyr) before the mid-Pleistocene transition. Earth is currently in what climatologists call an interglacial period, a warm pulse between long, cold ice ages when glaciers dominate our planet’s higher latitudes. For the past million years, these glacial-interglacial cycles have repeated roughly on a 100,000-year cycle. Now a team of Brown University researchers has a new explanation for that timing and why the cycle was different before a million years ago. Raw data is “adjusted” and “homogenised” to show whatever is politically correct. Cooling the past says nothing about warming in the future. In cooperation with NOAA, NASA simply cooled the past to make the post-1930 cooling go away. Whatever one may think of Trump, his transition team’s questions for the Department of Energy are penetrating. They are causing some little worry among the adherents of the man-made global warming religion. Willis Eschenbach has the list of questions and his comments over at WUWT. Man-made climate change (actually the lack of such), vast grants to companies which go bankrupt in the night, jaunts to resorts for climate meetings, prolonging nuclear power …. are all apparently within the sights of the transition team.